This was part 4 of the 5 part Guardian’s story, with the same cast and art team. 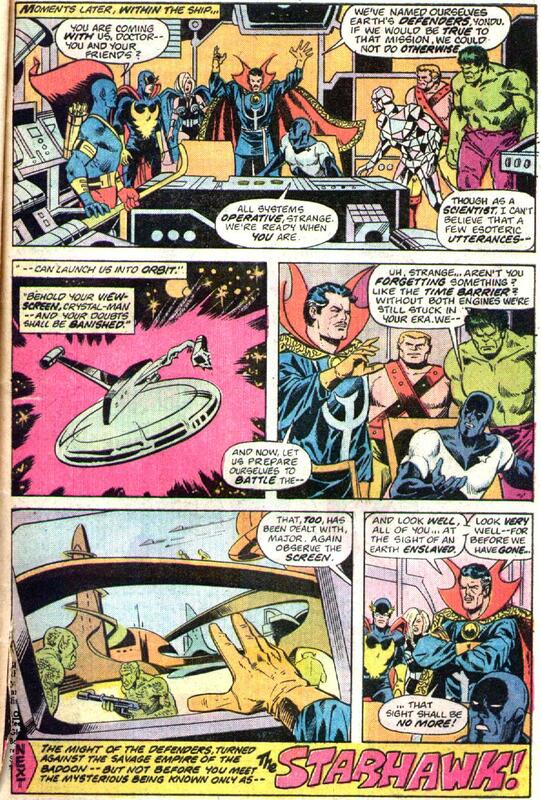 The story opens with a recap showing Badoon boarding the Captain America and that Doctor Strange was hooked into the ships systems to find everyone not on the ship. On the ship, the Badoon along with a contingent of Zom troops. 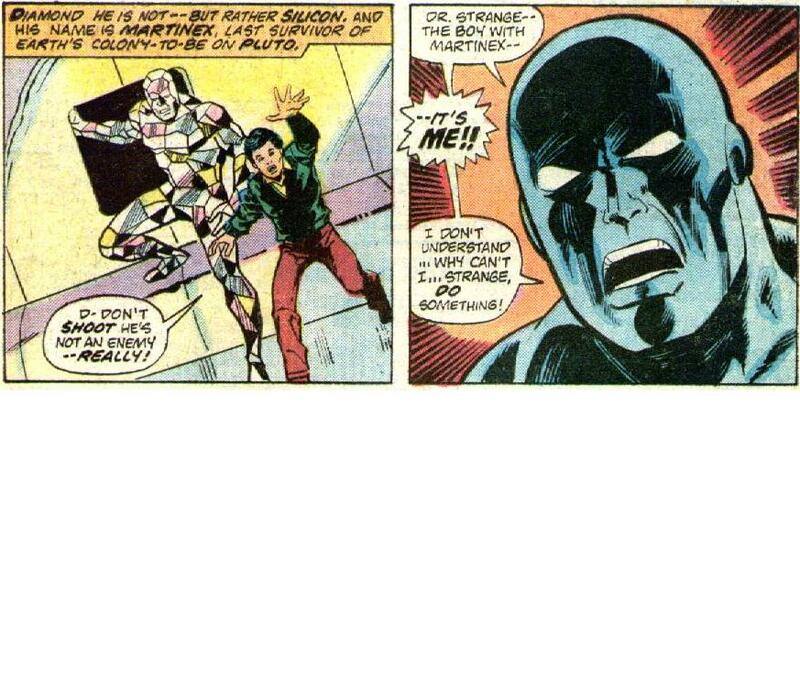 Initially doing well, the crew are eventually outmanouvered into surrender whilst the Badoon check on Doctor Strange, but with his astral body away searching for the others, the Badoon mistakenly declare him dead. Strange finds Val & Vance on a world called Capella along with the stranger from the previous issue. The stranger tells Val to put away her sword, telling her that she will become nauseous again, as the swamp-lizard creatures are all female. When Vance queries this, the stranger points out that if a Brotherhood of Badoon exists, then so must a Sisterhood. They are both then led to the city of Venisia, home of the Badoon Sisterhood. The group are amazed when they are invited to an audience with the queen of the peaceful, elegantly dressed female Badoons. On the world of drunks and loons, Hulk and Yondu are being prepared for the games. Hulk has been fitted with sort of high tech gladitorial garb, while Yondu is left as is. Emperor Goozot gloats of the heroe’s situation whilst his courtesan takes an interest in the Hulk, seeing his difference from the soft and drunken men of her world. Yondu and Hulk are led to a TV studio where a panel decide that Mr Blue (Yondu) should be impaled. He is teleported to a room with a floor that has a 45 degree incline, to face three robots with sharp lances for hands. He is awakened from the stasis beam from the previous issue and is able to destroy one of the robots almost immediately. As a bonus he is given a mace, which to the surprise of the panel he uses expertly to destroy all the robots before he is teleported back to the studio to be seized by guards. Back on Capella, Queen Tolaria of the Badoon welcomes Val, Vance and the stranger, who she identifies as Starhawk. Vance demands answers and the Queen explains that the males and females of the Badoon hate one another and only mate once per life cycle. 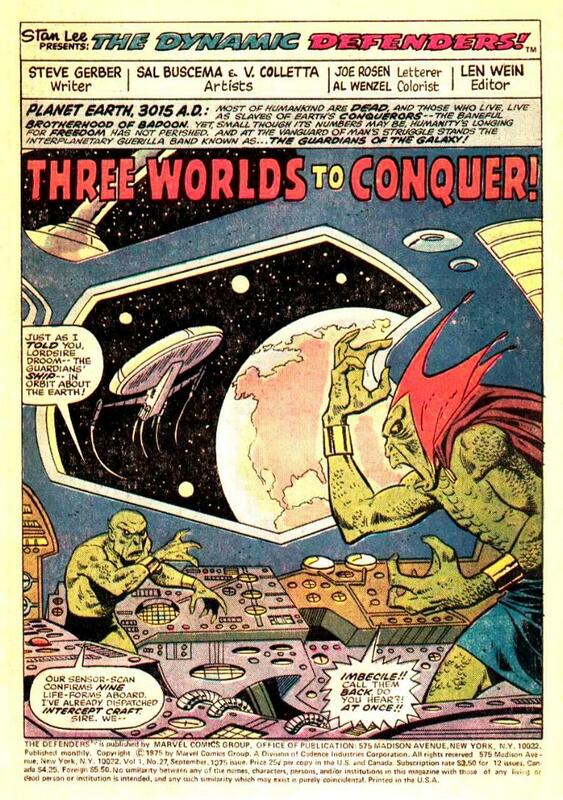 The rest of the time they warred until the male Badoon developed technologically and were able to leave the planet. Now they return once per generation to mate and collect the eggs which they incubate and hatch off world and return again to drop off the females who are brought into and raised by the Sisterhood. The Queen assumes that the males are equally peaceful and is appalled by their rapacious conquest of other worlds. Queen Tolaria confirms this with Starhawk who agrees and notes that he has done all he needs do for now. Energy wings form between his shoulders and feet and he flies into the air and into space. Doctor Strange finds Val and Vance and is able to transport them to Earth, just in time to see Martinex, Nighthawk and Charlie-27 facing a Badoon firing squad. Notes: All in all a satisfying part of the 5 part story. We are formally introduced to Starhawk and his particular brand of frustrating assistance. It was also nice to see Yondu get something to do, pitting him against the robots showcases his mastery of weapons and since you know Hulk’ll be safe, this gives us the only point of genuine jeopardy. At the point, the Guardians of the Galaxy are guest stars only, but this was soon to change. The Guardians return in Defenders 29. Defenders 27 had a cover date of September 1975 and was on sale in June 1975, sharing the spinner racks with Batman Family #1, Captain Marvel # 40, Flash #236, Giant Size Thor # 1, Kamandi # 33 and X-Men #94. Following on from issue 26 this was part 3 of the Guardians story, again same cast and credits, so lets get on with the show. 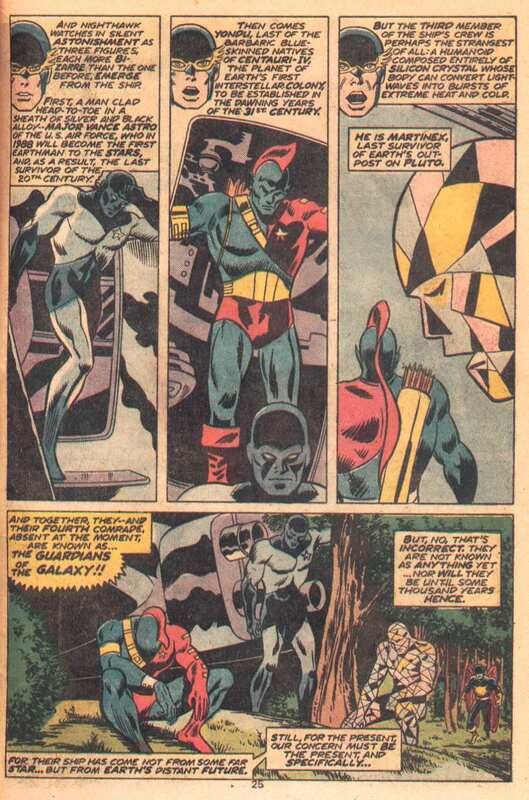 The Badoon observe the recently appeared Captain America and the Badoon in charge orders the ship to be taken intact. Inside the ship Martinex is preparing to send Valkyrie, Vance Astro, Yondu and the Hulk down to New York via the ship’s matter transporter. Just as he does so, the Badoon send a signal to the ship and the matter beam is split sending the team to different locations through subspace. From inside the ship, the signals look lost and in a panic Jack Norris, who had sneaked aboard before the ship let the 20th Century, blames Martinex for killing his wife. This despite the fact that Valkyrie doesn’t consider herself Jack’s wife, nor does she ever remember being so, Doctor Strange holds him in place as he and Martinex try to work out what to do. The Beams were split into two paths, one led Vance and Val to a swamp-like world with two moons. 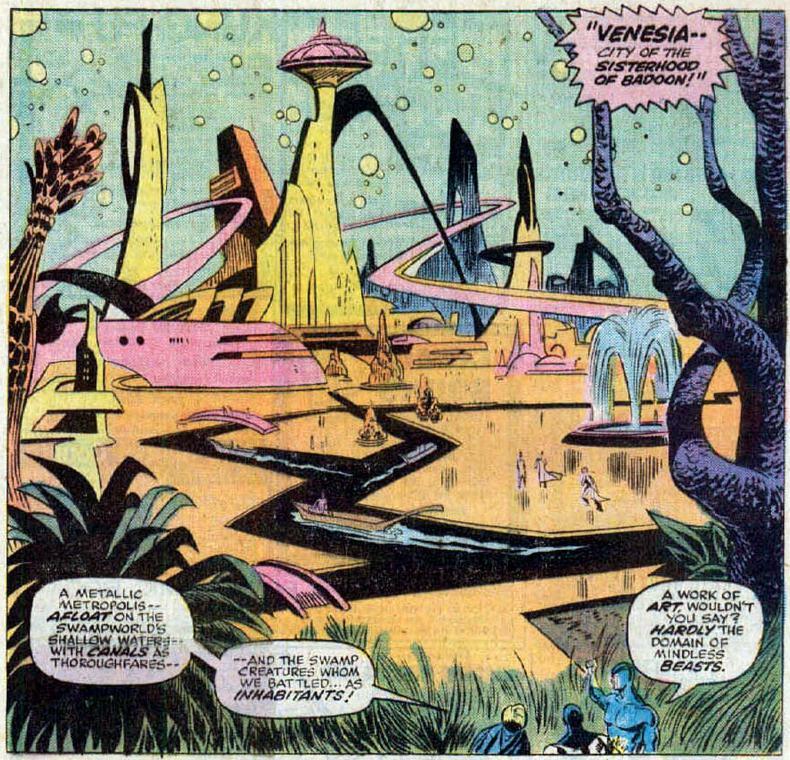 Hulk and Yondu arrive on a much more earth-like world with humans on it acting drunk/drugged. Yondu and Hulk find a woman being attacked by several men with sticks, when they step in to save her, their reward is a slap. Hulks notes how everyone they see is acting stupid. They are quickly set upon by silver robots which are promptly destroyed. Another, larger robot appears and screams that Hulk & Yondu have killed her babies and zaps the two of them with some sort of stasis beam. They are led to a man dressed like a roman emperor who surmises that his allies, the Badoon have sent them to him and demands they be taken to the studio for interfering in the death festival. On the ship, Martinex hooks Doctor Strange up to the ship’s computers to enable the Doctor to search mystically for the missing teammates. This releases a lot of power, which is noticed by the Badoon. On the swamp world, Valkyrie & Vance are set upon by some reptilian looking creatures with matted hair and their numbers start to wear the duo down. 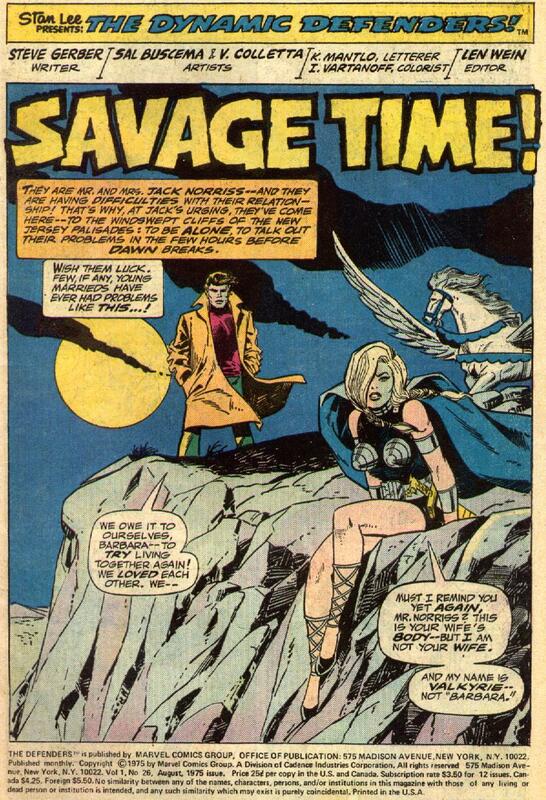 Valkyrie puts up a valiant effort, but notices how weak and nauseous she is, not how she is when fighting males. Just as she collapses, Vance clears away the reptiles using his psychokinetic power as he tries to pull her to safety a glowing figure beckons them. He uses a healing light to restore Valkyrie to full strength and then informs them, that they both owe him a debt. 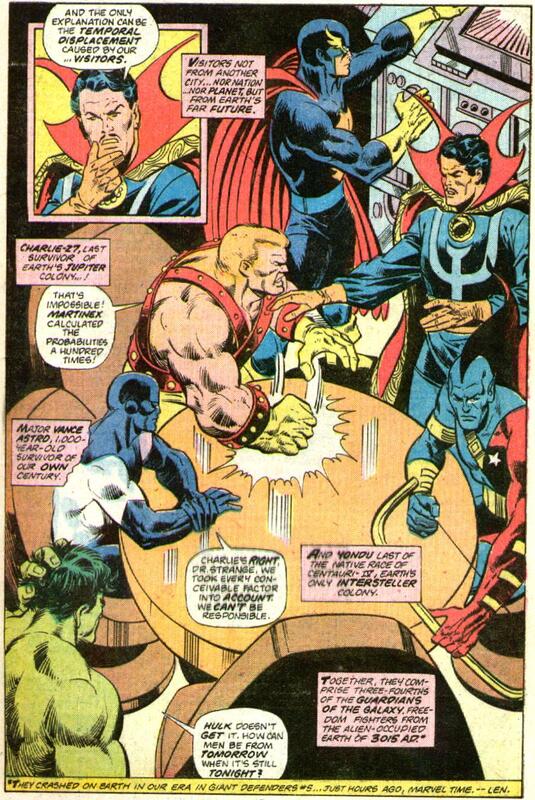 On the ship, as Doctor Strange continues his search, the Badoon have boarded the Captain America. Notes: Based on the synopsis, this would seem like a dense issue, but it is in fact quite well paced and action packed. A lot happens in the 22 pages and it’s always cool to see Hulk smashing stuff, Usually part three can be a bit of a filler issue, but this isn’t. More pieces of the puzzle are laid out and it’s about to get interesting. Defenders 26 had a cover date of August 1975 and hit the stands in May 1975, sharing the spinner racks with Action Comics 450, Amazing Spider-Man 147, Flash 235, Invaders 1, Justice League of America 121 and Skull the Slayer 1. Following straight on from Giant Size Defenders 5, this was the second part of the 5 part Guardian’s story. It contains the same characters as last issue, so won’t be too fussy about a roll call. It was written by Steve Gerber, on his own this time, with Sal Buscema and Vince Colletta bringing the art. The story opens with Valkyrie sitting on a cliff, being talked to by Jack Norris. This was a returning subplot. 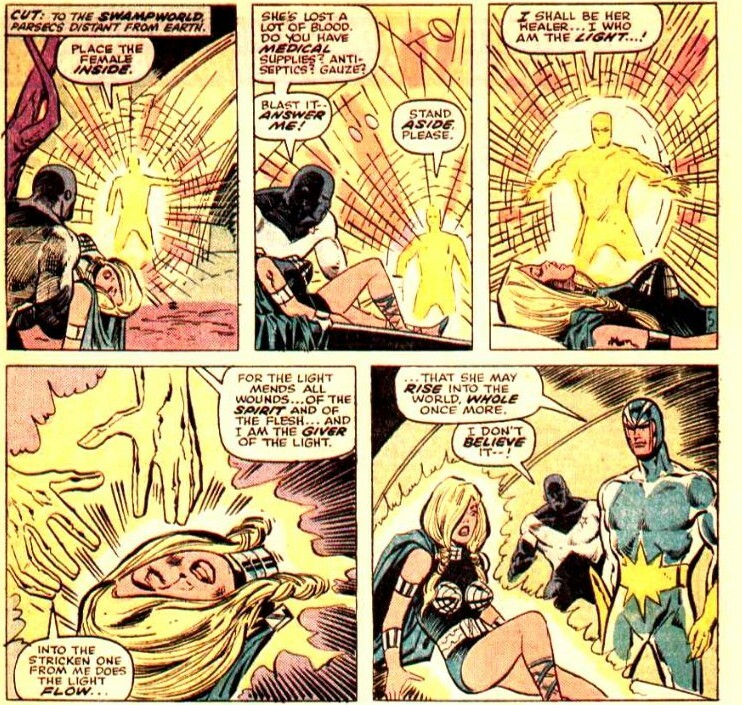 For those unfamiliar with the Defenders of this time, Valkyrie was a personality, mystically created by the Norse Enchantress and was placed into the body of Miss Barbara Denton, completely wiping out her personality and memories. The problem was that Barbara was now Mrs Barbara Norris a newly wed and her husband from her previous life had tracked her down. Val liked Norris, but he couldn’t accept that Val wasn’t his wife. He presses this point again by kissing her to reawaken her feelings for him. Considering how date rapey that sounds, he’s lucky that she doesn’t cut something off when he tries that. Just then an earthquake strikes, one of a number of strange meteorological events occurring due to the temporal disturbance around the Guardians of the Galaxy. The Guardians and the Defenders discuss this, as the USS Captain America is discovered by local news and the local military. 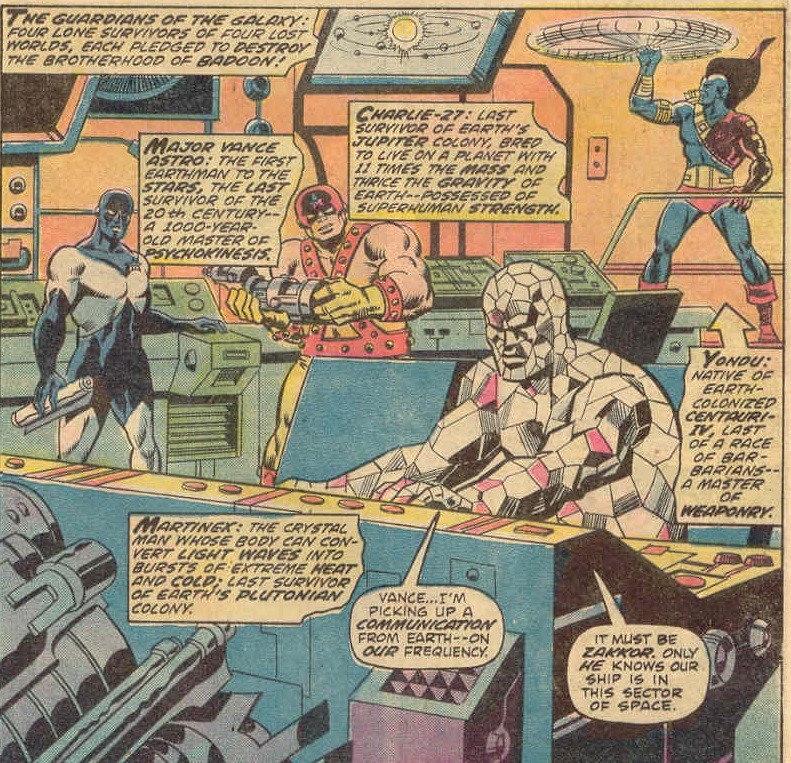 As this happens Martinex, who had remained on the ship to make repairs, walks out along with Vance Astrovik, the younger version of his team-mate Vance Astro. Vance sees this on TV and asks Doctor Strange to do something. Strange focuses and sends an energy bolt to the ship and causes it to vanish and appear nearby. With all reunited, the majority of the rest of the issue is taken up with Vance telling Young Vance the history of things to come, from ozone depletion, cyborgs, riots and the odd invasion it does paint a bleak picture of the time again, or since I’m reading this in 2014, the last 30 or so years. Vance finishes explaining this to his younger self before Doctor Strange WIPES THE WHOLE THING FROM THE CHILD’S MEMORY! Then he sends the boy home to… well what does the Doc care. Ok rant over, now on with the plot.. through the Deus Ex Machina of Doctor Strange’s magic, the ship arrives in orbit over a thousand years after they left. 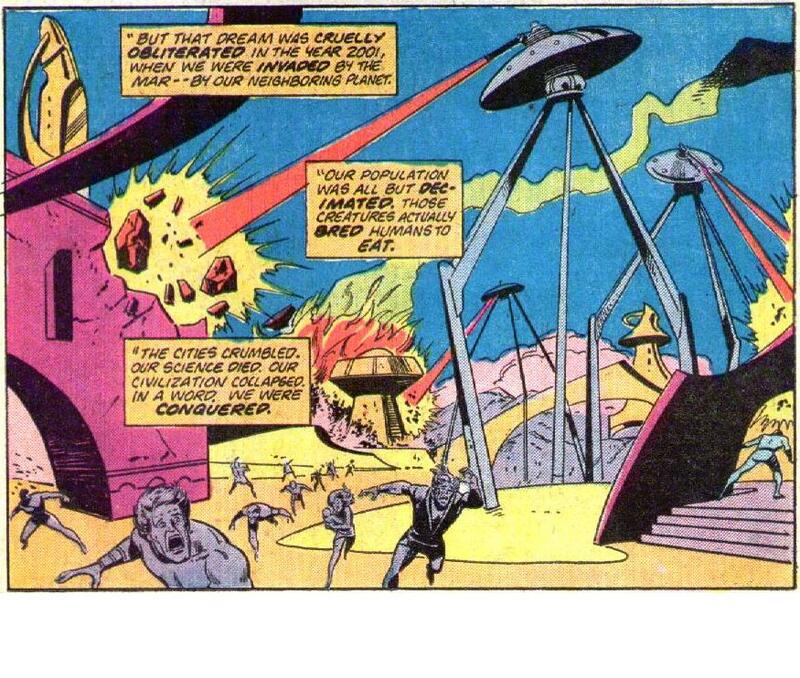 Doctor Strange then tells them to look at the conquered Earth, it won’t be like that for long. Not a great issue on it’s own. Half of it is a very exposition heavy info dump and the rest of very much treading water, with many of the characters and the plot waiting for something to do. As as single issue it’s sub par, but it works as part 2 of a 5 part story it works rather well as it leaves the stage set for the Defenders and the Guardians of the Galaxy to face the Badoon. 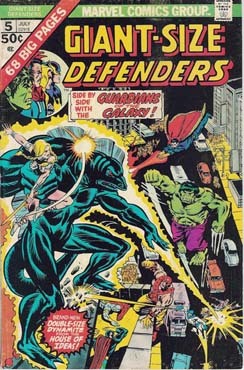 The Next appearance of the Guardians came in July 1975’s Giant-Size Defenders # 5, which went on sale in Aril 1975. It shared the racks with Action Comics # 449, Amazing Spider-Man # 146, Avengers # 137, Joker # 2, OMAC # 6 and the start of a new era Giant Size X-Men#1. The story titled ‘Eelar moves in mysterious ways’ is scripted by Steve Gerber, but had plot contributions by Gerry Conway, Roger Slifer, Len Wein, Scott Edelman & Chris Claremont. The art was by Don Heck’s pencilled & Mike Esposito inks with additional background inks by Dave Hunt. The Defenders was a monthly title in the 70’s which offered a more casual and less establishment superhero team in the marvel universe. 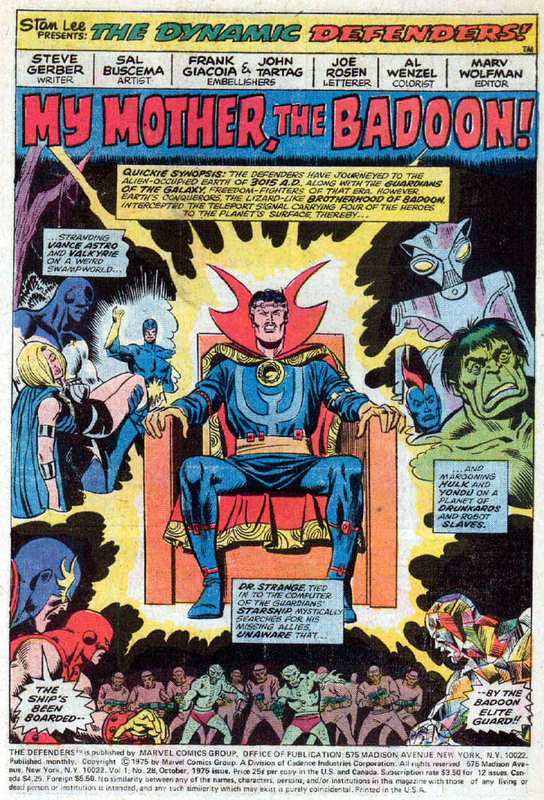 Originally formed by Doctor Strange, the term consisted of Doctor Strange, Silver Surfer, Namor and the Hulk. This non-team however almost never had any team consistency and members dropped in and out as they felt like. By Giant-size the team was Doctor Strange, Hulk, Nighthawk and Valkyrie. The group operated out of Greenwich Village in New York and it’s there our story begins. The Story opens with a mugging of a shop owner by three criminals. The robbery is interrupted by the arrival of Charlie-27 the huge Jovian member of the Guardians who makes short work of the would-be thieves and carries their victim to a local hospital, dismayed that human beings attack one another, a shock to a man who has seen humans and human related species become more and more endangered in his time. As this is happening Doctor Strange, Valkyrie and Hulk are flying overhead to investigate temporal displacement vibrations. They are just looking at strange lights in the river when a ferry is attacked by hundreds of fish. 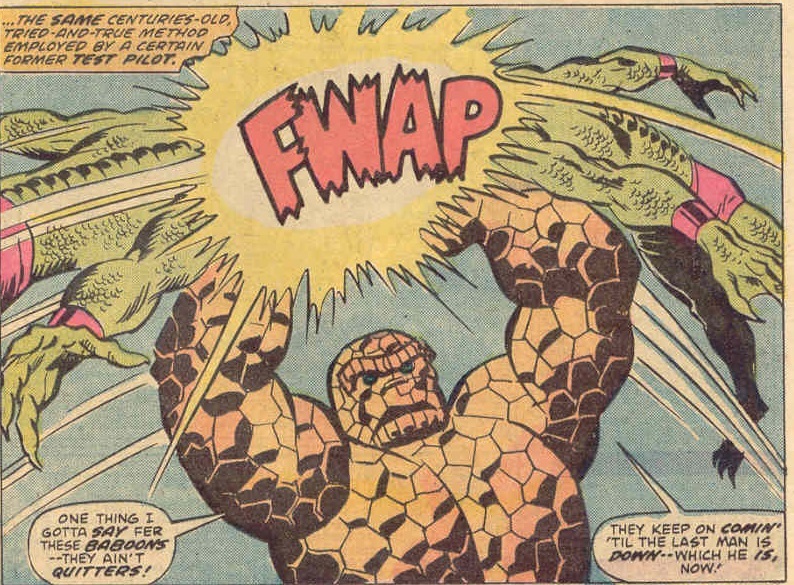 As Val and the Hulk try to deal with the fish, Doctor Strange is attacked from beneath the water’s surface. By an eel-like creature who speaks telepathically and speaks of a destiny of empire and his race conquering the stars. After leaving Strange to his team the creature dubbed Eelar jumps and announces his intent to attack the nearest city, in this case New York. Meanwhile upstate another member of the Defenders, Nighthawk, is taking a morose flight to clear his head, recapping his recent woes as a large aircraft streaks through the atmosphere and crashes nearby. This is also witnessed by inhabitants from the town of Saugerties including a little boy who is quite excited by the events transpiring before him. Back in New York City, another attack is on the way on the hudson tunnel in which two cardboard cut out cops find themselves in the hudson tunnel during a fish attack, let me repeat this part of the show…A FISH ATTACK! One of the cops is petrified and the other runs to get help and it is at that point the Defenders arrive. Hulk and Val prevent the fish from getting in by plugging a small hole already made by the fish. The scene then changes to the little boy who tries to tell his parents about the spaceship, but is sent to his room as punishment for lying, quality parenting from the dad there. Stuck in his room, which doubles as a shrine to Captain America, the boy decides to sneak out and prove to his dad that the ship was real. Before he can do that, Nighthawk finds the ship which has the words Captain America emblazoned on the side. 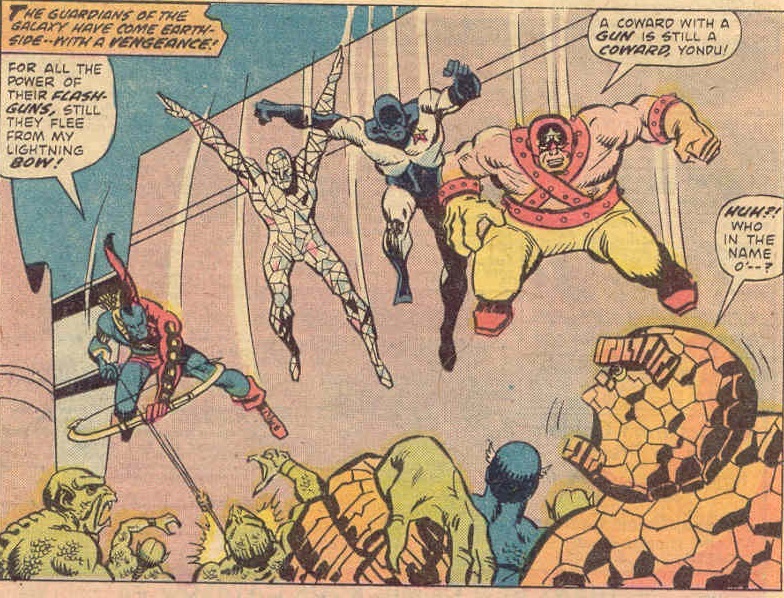 As he lands, he sees three strange figures leave the ship; Vance Astro, Yondu and Martinex, the remaining three members of the Guardians of the galaxy. 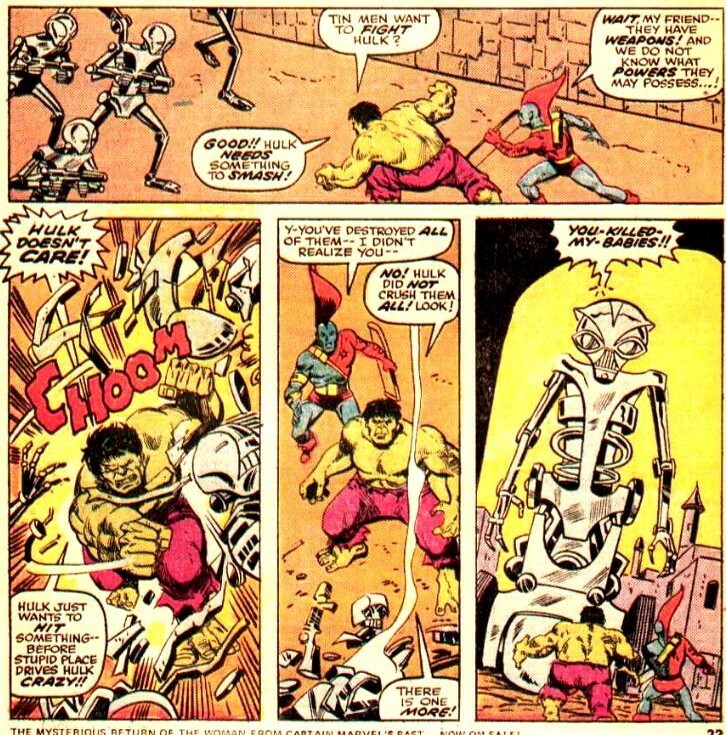 In times square Eelar begins his attack on the people in the city and is engaged by Hulk and the rest of the Defenders, observed by Charlie-27 who stands in the crowd. Meanwhile on the Captain America, the Guardians introduce themselves the Nighthawk and tell him of their intent to retrieve Charlie. Using the ship’s systems, Vance, Yondu and Nighthawk teleport to Charlie’s location in time to see Eelar’s attack on time’s sq. 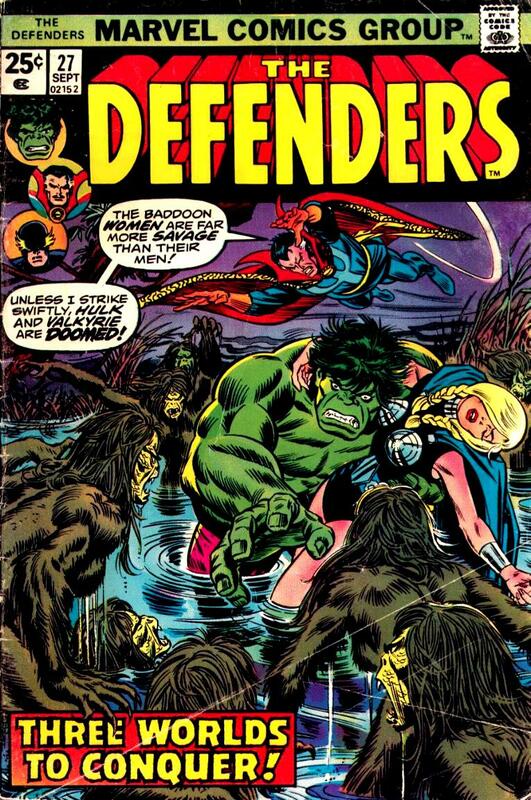 The Guardians and Defenders team up to stop Eelar who is still spewing his soliloquy on being a conqueror. 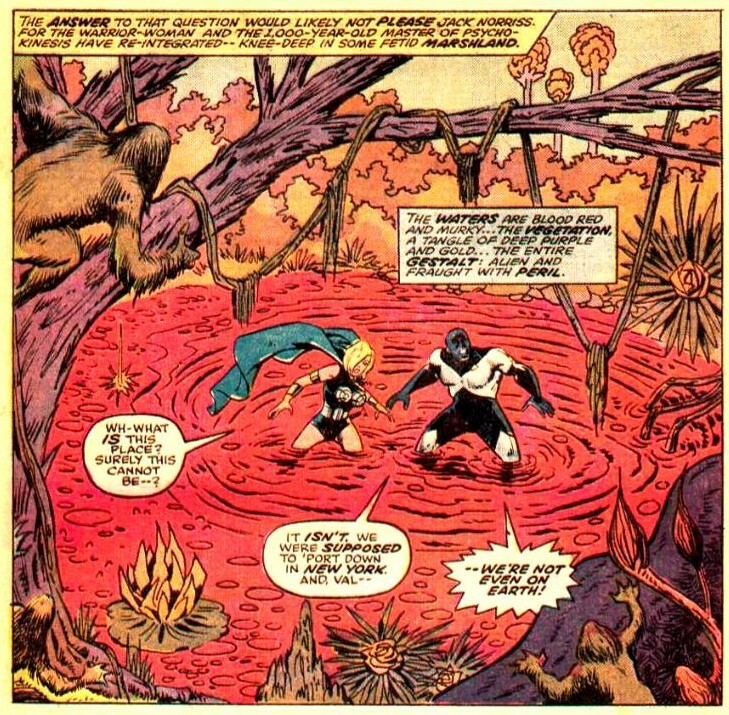 In the course of the battle, both the Guardians and Doctor Strange find Badoon Programming helmets which seem to have been found nearby, one in a pawn shop where the roberry from the beginning of the story took place and the other from under the water, where the temporal disturbance was seen which was the home of several eels. 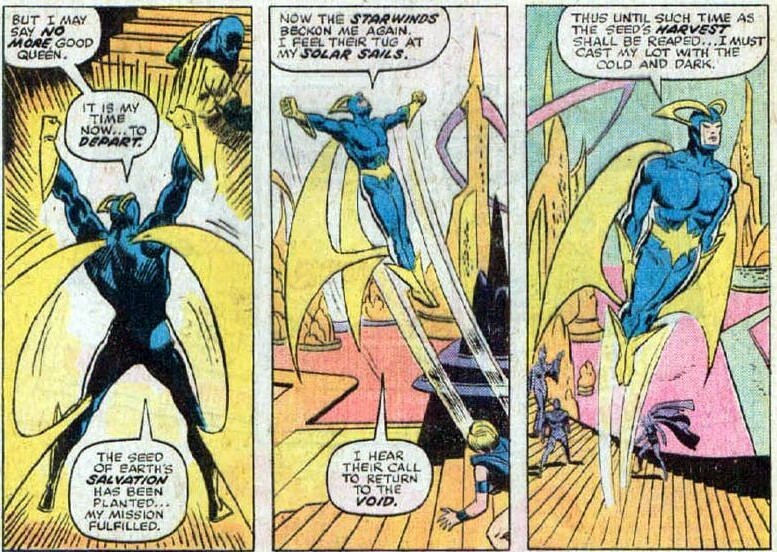 Strange realises that the disturbance itself was not caused by Eelar, but perhaps by one of the Guardians.The two teams combine and working together defeat Eelar, who through Strange’s magic is returned to the form of an electric eel. There are two epilogues. 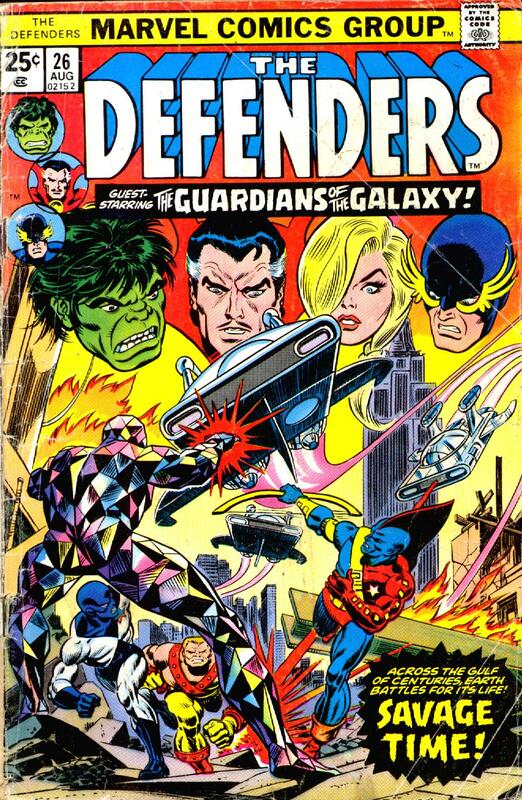 One is at the Defender’s home and the Guardians explain that they came to the past to retrieve records of a previous attempt by the Badoon to invade Earth and the Defenders agree to help the Guardians return home, but know of no attempt by the Badoon ( a mystery for another issue methinks) and wish to help the Guardain’s in their fight. Two: Back on the Captain America, Martinex is joined by the young boy from earlier who is asking lots of questions about where Martinex comes from. The boy tells Martinex that he will be an astronaut when he’s older and will change his name before then, from Astrovik to Astro, Vance Astro. I liked this issue, despite the at-times meandering story and the less than stellar art. Eelar is a credible threat to the Guardians which they themselves caused and the subplot with Vance’s younger self is very enjoyable. This is the start of a 5 part story with both the Defenders and the Guardians of the Galaxy returning to the 31st Century to face the Badoon. Face front true believer, it’s about to get epic. 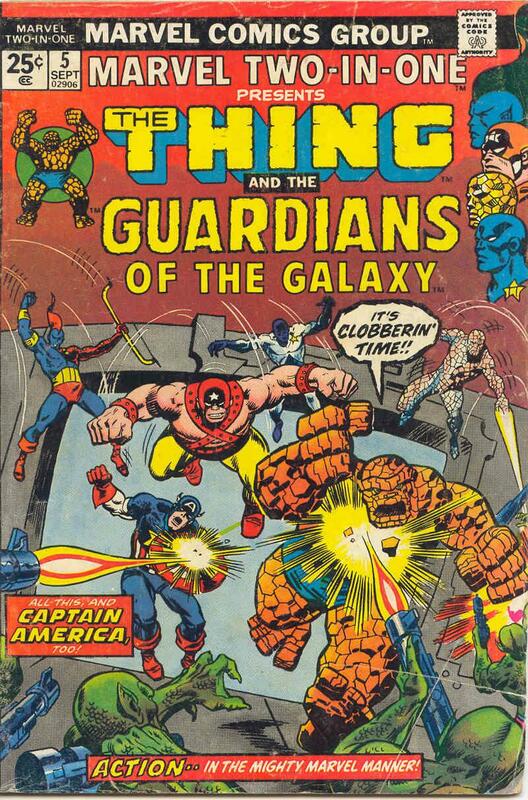 The next Guardians of the Galaxy appearance was September 1974’s Marvel Two-In-One # 5. On Sale in June 1974 it shared the spinner racks with Amazing Spider-Man 13, Flash 229, Captain Marvel 34 and Justice League of America 113. Just like the previous issue the story was by Steve Gerber, Sal Buscema but now joined by Mike Esposito on the inks. The story opens with The Thing and Captain America along with Sharon Carter Agent of S.H.I.E.L.D. being delivered unconscious to Drang who is ruling earth as part of the brotherhood of the Badoon. 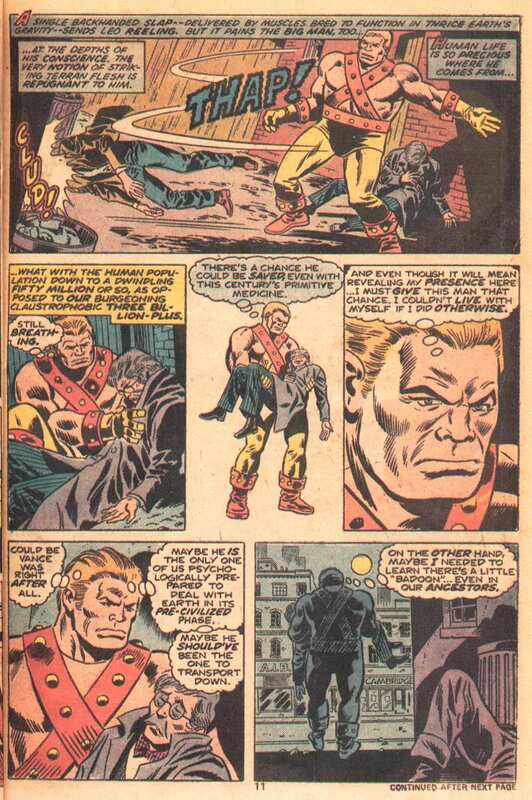 Drang and the mind probe he uses on Cap were seen in Marvel Super-Heroes 18. The Mind probe is a way of recapping the events of the last issue. Once the Badoon realise who they have with them they decide it’s best to kill them. It’s at that point the The Thing takes action and the three of them fight their way out of Drang’s throne-room and make a run for it in a great series of action packed pages. Once out in the street they are attacked by more Badoon and Zom units and again make their getaway. Tarin from the previous issue meets with the resistance leaders to get them on board and their skepticism is short-lived when another member of the resistance backs up her story with video evidence and then the call goes out to the Guardians of the Galaxy. Vance Astro, Charlie-27 and Yondu all in new uniforms along with Martinex receive the message and decide to return to Earth to help the resistance against the Badoon more directly. It is worth noting, that this is the first appearances of staples of the Guardian’s mythos; the Guardian stars, red white and blue stars worn on the chest which act as communicators and teleport transponders a good decade before it appeared as an idea on Star Trek the Next Generation as well as the USS Captain America. The Thing, Sharon and Cap still seeking allies are once more attacked by the Badoon and just as a Badoon is to call for reinforcements, a golden arrow strikes his neck and the Guardians of the Galaxy have arrived. 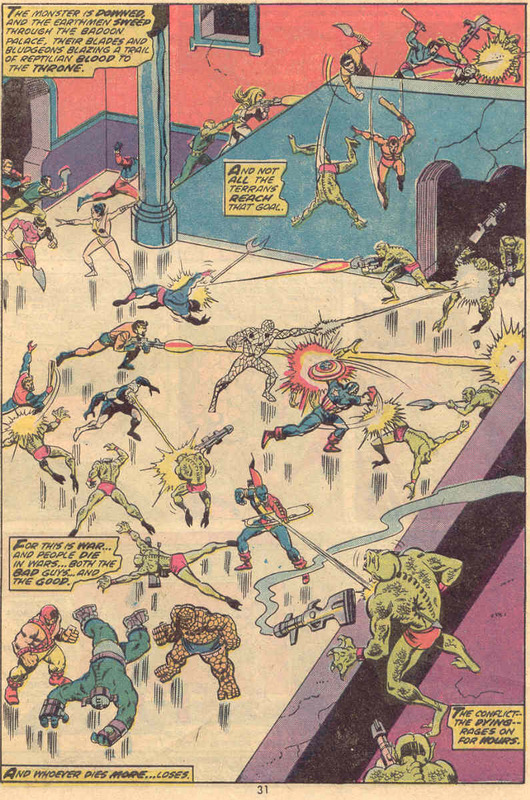 With the seven heroes together, the Badoon are made short work of and at that point even does the meet and greet thing, with Vance Astro recounting his origin to Cap and the arrival of the local resistance. With an army in place, big guns like the Guardians and the Thing and a legend like Cap to lead them, it is time to attack and following the Thing’s lead the army head straight for Drang’s throne-room to take out New York’s seat of power. After a brutal battle, they are victorious and while they only have freed New York, one part of one world in a solar system the Badoon have completely conquered it is the first victory and as Cap points out, it won’t end there, taste of freedom is never enough. The Badoon will fall. 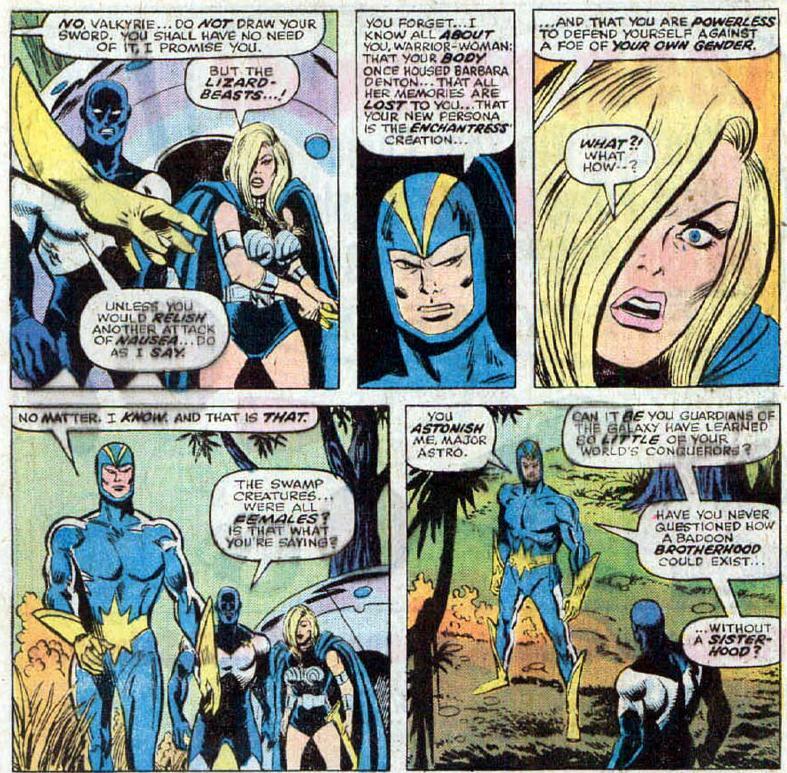 With that, Cap, Sharon and the Thing return to their own time leaving the Guardians with a war to win. Whilst the final act seemed a little rushed, from meeting up with the Guardians to the end being a little too quick for me, the story as a whole was very enjoyable, Cap show’s the good guys how to win and the Thing shows the bad guys it’s clobbering time. 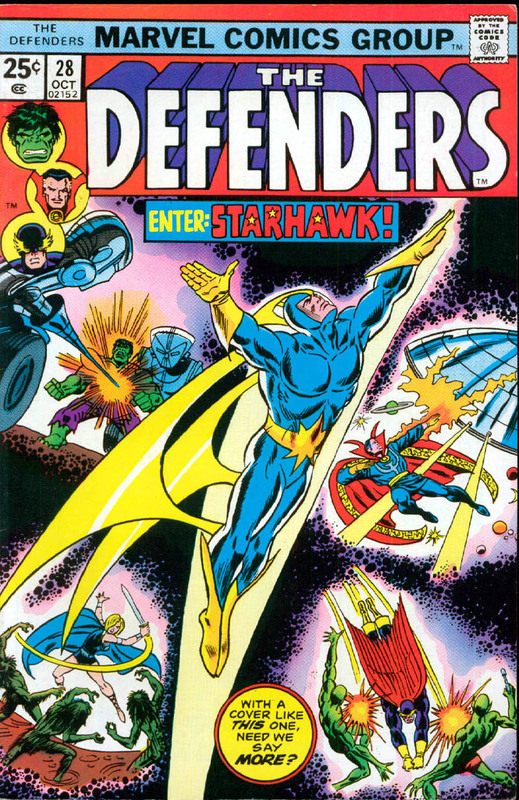 The Guardians return in a number of Defenders appearances which I’ll be looking at soon.